Donald Trump posted an OFFICIAL CAMPAIGN LIST of Trump Pennsylvania delegates on Twitter on Saturday. 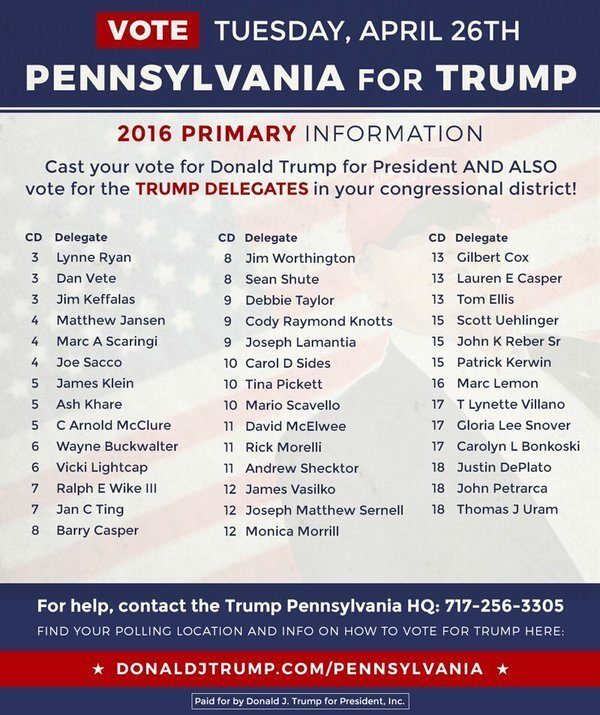 Voters in Pennsylvania MUST VOTE ON THESE CONFIRMED TRUMP DELEGATES In their district. BUT BE WARNED: There are Cruz vampire lists popping up on Twitter. This one list from KellerForDelegate website includes candidate Gabriel Keller who is not the original list. Be alert for fake Trump Pennsylvania delegate lists. Refer to the Trump websites or Twitter list.